IT'S time the Lismore City Council and Gold Coast Titans started to negotiate with the National Rugby League about bringing a premiership game to Oakes Oval next season. The NRL is heading to Sunshine Coast Stadium tomorrow where South Sydney will take on the New Zealand Warriors at Kawana Waters. 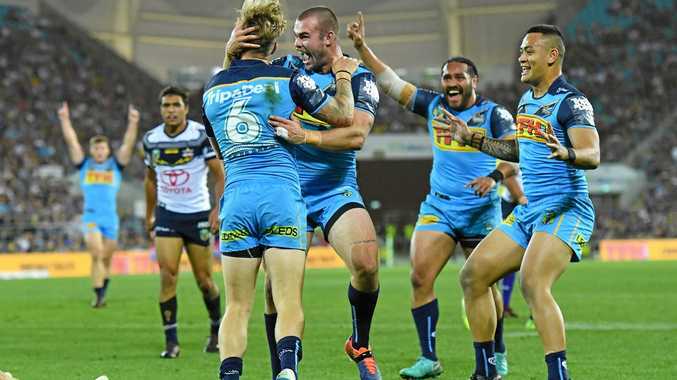 The game is expected to attract a record 11,000 people after 10,680 turned out to watch the Titans play the North Queensland Cowboys in a trial in February. An NRL trial is not enough to get a big crowd to Lismore any more and we should be thinking competition game as early as next season. Oakes Oval was upgraded last year at a cost of $2.8 million with an extended playing area, additional seating and improved facilities providing a capacity of about 10,000. They would need to bring in extra seating with some of the smaller grandstands around the ground not having been replaced. Lismore hosted the Gold Coast Suns and Sydney Swans in a JLT Community Series AFL preseason game last month in front of 4918. There was plenty of staff from the AFL there to ensure everything ran smoothly for live television coverage, so the NRL should be able to adapt to the same surroundings. There are already plans to hold a second JLT game next year and AFL will get first crack, having contributed part of the funding to make it purpose built for Aussies Rules. However, Lismore is still a rugby league town and the NRL easily holds the Oakes Oval attendance record of 8612 when the Titans played Parramatta in a trial in 2007. The City v Country clash in 2005 attracted a crowd of 8553. The NRL last played a trial in Lismore between the Titans and Warriors in 2009, and there has never been any real discussion of bringing them back since. There is a lot less buzz around the Titans now than there was back then and poor crowd figures at Cbus Stadium, Robina, on the Gold Coast over the past few years reflect that. They have had one home game this season where only 9843 people turned out to watch them play Canberra on March 17. We still have strong links to the Titans with centre Brian Kelly, fullback Michael Gordon, halfback Tyrone Roberts and winger Anthony Don having all grown up playing on the Northern Rivers. The game could easily be promoted around them returning to play in front of a home crowd. Northern Rivers signed a formal partnership with the Titans last August and and its junior teams now wear Gold Coast colours in Country Rugby League representative games. The lines of communication have never been more open to get the ball rolling.